Hello Survivalists! 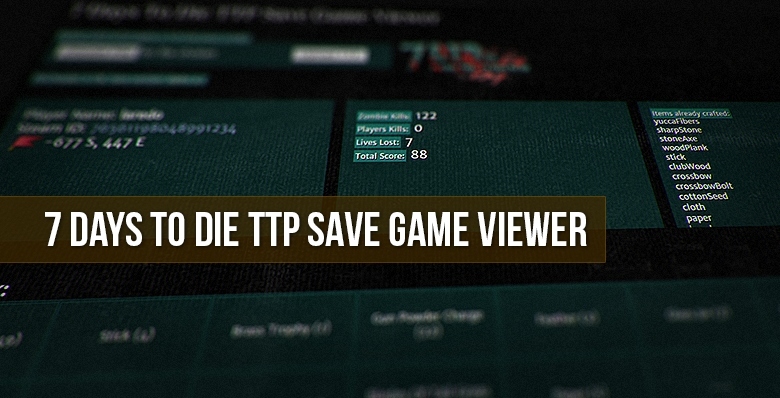 I was working lately on viewer for TTP save game files. My goal is to make server admin support tool that they could view players inventory in order to search for anomalies. I know that Alloc's tool alredy has this feature, but I needed to check out inventory while player is offline. Also I wanted to add other cool info that is stored in .ttp files. For now there is only some basic functionality - player name, steam ID, belt and backpack grid with player items. Items are displayed in the same order as in game. But ttp files have a lot more info inside i.e. known recipes, spawn position, item durability or all "physiology" data and more. I'm pretty sure I can access and read this data although this is sluggish process. TTP Tool is unstable with game save files converted from previous versions of game. I.e. If you have one tpp file from alpha 9.0 to alpha 9.3 tool can display gibberish data. This is on TODO list, after implementing all basic stable features. Fixed food and water indicators. Now when player have 0% it should display correctly. If item stack is greater or equals 64, items are highlighted - this going to be improved. Each item will be checked for the proper max. stack size. Fixed "Already Crafted" and "Known Recipes" function. No more "bushes". Added items counter for "Already Crafted" and "Known Recipes"
Integration with crafting.7dtd.pl. Now recipes in "Already Crafted" and "Known Recipes" lists are clickable and show you recipe for each item. Added Player Stats: Zombie Kills, Lives Lost, Players Kills, Total Score. havent had a chance to test this yet as im at work but this concept wise is brilliant! thank you for your hard work!!! planning to open source it? bigc90210 and zleipt - thanks guys! - Code is total mess and to be honest I'm little ashamed of it ^^ I'm more art person than coder. - There is very small difference between viewer and editor. Therefore knowledge about ttp file structure can be nasty for players with bad intentions. Also, the full TTP structure can be easily found out by looking at the games code, took me no more than 5minutes a few days ago. I'll check it out. Thank you Alloc! Your work is awesome! "Btw, the server mod also allows to look at an offline players inventory since rev147 (2 days ago) "
I was going to start making a tool similar to this using the output from that, nice to know its working off offline players aswel now. I've added few things for the viewer. First is some basic ttp header validation and game version check. Interesting thing is that version bit repeats few times in the whole file. But I'm not quite sure why yet Maybe some crc stuff maybe coincidence. Second new buggy feature is "already crafted items" list. It should work but on occasion it can display few "bushes" like "����C;". This is because I didn't catch firm grip on the offset for now (todo). Next step is "Known Recipes" list - this should be easy when "already crafted" will be done. Huge problem for me with that list was item delimiter. It seems to be probably random hex number but always lower than 0x1E. I'll investigate it further. Also some layout changes and other minor stuff. I've also decided to prepare some graphic visualization for the ttp file structure when I'll figure most of it. This should help some folks with their tools. Is their any way to add Items to a players Inventory by editing this? It could be very helpful for giving out lost keystones and other items. Technically writing/adding items to file is pretty easy task. But before this I have to understand ttp file in 100% and read all it's contents (for now it's like half of file for me). With that, making full editor would be cakewalk. Now I think such editor could be useful for admins. I'll keep that in mind. Thanks! - If player set way point, viewer will display its coordinates. Way point was easy to read from file, but harder to implement. PHP is not really big endian and long int friendly ಠ_ಠ But now player position should be easy to decode.